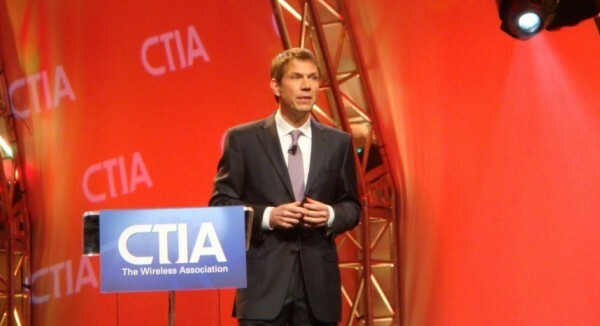 Skatter Tech is live at the CTIA Wireless 2010 (Day 2) Keynote with Dan Hesse (Sprint), William Morrow (Clearwire), René Obermann (Deutsche Telekom), John Stanton (Trilogy International), and Padmasree Warrior (Cisco). The event should begin shortly. We’ll be updating the live blog throughout the event, so keep refreshing for updates. 9:05AM – The event just got started. The President and CEO of CTIA Wireless, Steve Largent, is speaking. He’s discussing safe driving practices. Strongly emphasizing on pushing technologies that help keep the driver focused. Believes that tools that help keep a driver’s eyes on the road and off the phone with hands free tech is important. 9:07AM – Largent is moving onto discussing Haiti donations. There was more than $32 million donated to the Red Cross just over Mobile Phones through Text Messaging. Over 23 million text messages sent to Haiti to offer helpful information on surviving the disaster. It was the largest hand-held driven relief effort. 9:12AM – More Haiti issues and solutions. With the power and network infrastructures destroyed after the quake, Wireless Technologies was the only way of communicating. The mobile phone service providers had to secure and keep their networks running since it was the only method of communication. 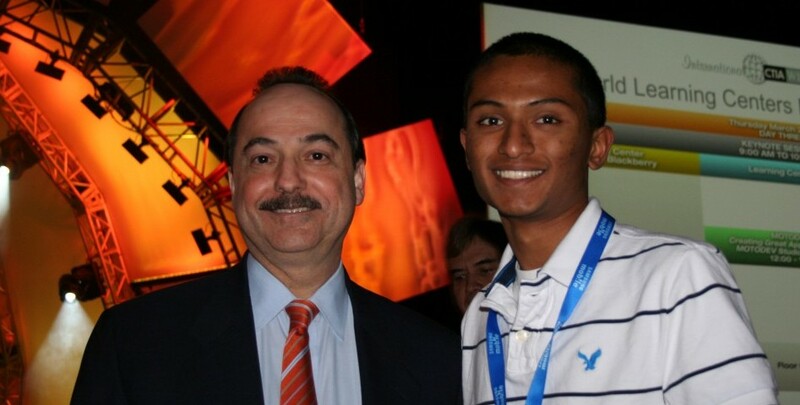 Side Note: Just ran into AT&T’s CEO right before the keynote. He told me to be “nice” when reviewing their service and phones. I’ll try to get a few minutes with him after the keynotes. 9:19AM – The company that was the first responder in donating mobile phones for use as T-Mobile. They sent over 10,000 phones for use in the disaster zones. Side Note: I’m running on Sprint’s 4G Network in Las Vegas, NV. Live blogging is a whole lot easier. Here’s the speed results. 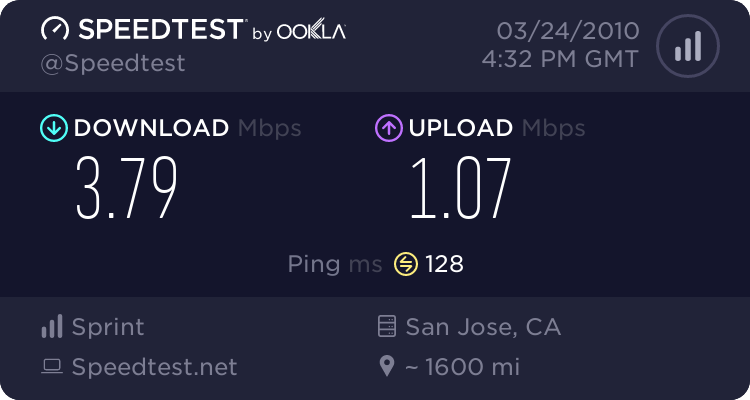 It’s a bit slow since I’m in a concrete conference hall, but I’ve seen it hit 5-6MB/s down speeds outdoors. 9:28AM – Haiti could and likely will be one of the first copper-free nations in the world. They plan on rebuilding the entire communication infrastructures over Wireless Technologies. Not wired. 9:31AM – Sprint’s CEO Dan Hesse hits the stage. After plugging his favorite pair of Vans as the most comfortable pair of shoes in the world, he got started on promoting 4G. He claims that in a year or two, the discussion won’t be about the number of minutes you have on your phone, but rather the amount of gigabytes of data transfer allowed. And speeds of course. 9:38AM – The reason Sprint chose Clearwire over other technologies was because they felt it was important to get their product onto the market first. And that’s why they have a competitive advantage in the 4G playing field. He did also admit that Verizon Wireless’s upcoming LTE 4G networks would be larger, but was careful not to say it might be better. 9:44AM – Dan Hesse is discussing the use of 4G and mobile technologies in the health care industry. Giving a humorous example of coughing into a phone to let the doctor hear whether it’s a dry or wet cough. Hesse believes that remote health care is a new phenomenon. It’s a way for doctors in isolated areas to transfer data, video, and test results back to main facilities for analysis and communication. Also can utilize video conferencing and video streaming to see patients. 9:48AM – Sprint seems to have finally begun touting the idea of live video chatting with a front facing camera on their 4G HTC Evo Android Smartphone. Their PR rep was careful not to disclose whether there were any apps that would utilize the front camera yet, but said the SDK will allow developers to take full advantage of the device. (I still can’t get over the fact that it has a 720p camera built in. Although I’ll need to test it, might eliminate the need for a Flip camera.) The HTC Evo is currently the most powerful smartphone that will be available through a U.S. carrier. 9:51AM – Clearwire’s CEO, William Morrow, takes the stage. He spent plenty of time in Japan, now wants to bring the US back becoming the leader in the best wireless networks in the world. Mentions that his Clearwire WiMAX network is built more like a computer network infrastructure versus a 3G infrastructure. Also mentions that their wireless spectrum architecture would truly help ease heavy loads on the network and that it wouldn’t get congested as quickly. He estimates prices for faster 4G networks will be cheaper than current 3G networks at slower speeds. 10:02AM – Discussing adding networking to every gadget on the market. He gives an example of Sony’s CEO mentioning that about 80-90% of their products would be network connected this year. He mentions the National Broadband Initiative and that his goal is to get that high-speed wireless network to larger markets. Average 4G customer today apparently uses about 7GB of data a month. Wants to reach a goal of 120 million 4G customers by the end of the year. 10:10AM – René Obermann of Deutsche Telekom is taking the stage next. Some interesting facts playing on-screen: 250 billion emails sent each day. Over 55 million messages sent through Facebook. 1 billion videos streamed on YouTube each day (also heard 24 hours of video uploaded each minute). In 5 years about 40% of business customers will be running on cloud computing. Also, US grew 29% and Europe grew 11% for mobile data usage rates. 10:19AM – Worldwide mobile data traffic rate is expected to grow by 60 times from 2008 to a projected 2013 date. Data traffic for average US customer is about 50% more than the average European user. T-Mobile HDSPA+ is supposedly more reliable than other U.S. carriers due to less congestion. They expect their speeds to jump to 5MB/s by the end of the year as they roll out their new spectrum. 10:35AM – Largest wireless spectrum to be auctioned in Germany soon. Wants to encourage investing to building larger and more powerful mobile networks. Wants to getting people in both the US and Europe connected to the internet more. I’m tuning out. I’m heading to the show floor. Check back tonight for updates!